Kim’s speech was highly anticipated as an opportunity for the North Korean leader to chime in as a year of whirlwind diplomacy appeared to wind down by December 2018. Kim did not travel for a fourth inter-Korean summit with South Korean President Moon Jae-in in Seoul, despite South Korean hopes, and the U.S.-North Korea diplomatic process ended the year without progress. Despite these hopes, the New Year’s Day address has historically focused mainly on domestic issues and this year’s was not an exception. Nearly three-fourths of the word count of Kim’s addressed was focused exclusively on directives and observations on the state of North Korea’s economy. 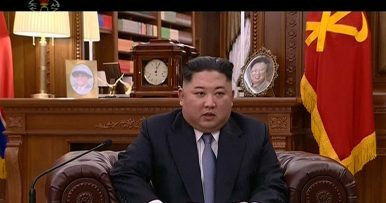 Below, I underline five significant takeaways on the domestic and international components of what Kim had to say on Tuesday. 1. It’s the United States’ turn to deliver. Kim’s message to U.S. President Donald J. Trump can be summed up in just two words: “Your turn.” The North Korean leader emphasized all the actions—the “practical measures”—that he had taken to work toward the “complete denuclearization” of the Korean Peninsula in good faith and kicked off the New Year by noting that for further progress to take place, the United States would have to follow up. Of course, this was far from a new or surprising message. It has effectively been North Korea’s primary talking point on diplomacy with the United States since the day after the summit in Singapore, when North Korean state media paraphrased Kim Jong Un’s observations on the summit and noted that for progress to occur, Washington would have to take steps toward North Korea. Kim warned against the United States attempting to impose anything “unilaterally” on Pyongyang—a warning for officials like U.S. Secretary of State Mike Pompeo who have repeatedly called for North Korea’s “final, fully verified denuclearization” before any sanctions relief can be delivered. if the United States does not keep the promise it made in the eyes of the world, and out of miscalculation of our people’s patience, it attempts to unilaterally enforce something upon us and persists in imposing sanctions and pressure against our Republic, we may be compelled to find a new way for defending the sovereignty of the country and the supreme interests of the state and for achieving peace and stability of the Korean peninsula. 3. No new pledges on nuclear weapons. Some early unofficial English translations phrased this in the future tense—that North Korea “will” do these things. Kim, however, was describing past directives—many of which he had outlined in a speech to the Central Committee of the Workers’ Party of Korea on April 20, 2018. That speech was mostly notable for his decisions to suspend the testing of intercontinental-range ballistic missiles and nuclear weapons. During the New Year’s address, Kim was primarily taking the opportunity to underline North Korea’s credentials as a responsible nuclear weapons possessor working toward denuclearization, which it defines quite differently from the United States. 3. Decoupling inter-Korean progress from progress with the United States. Kim underlined the remarkable pace of inter-Korean progress in 2018. Indeed, in a first, his speech was broadcast live on South Korean television, showing just how far the two sides have come. He referenced the September 19 inter-Korean Comprehensive Military Agreement, which was successfully implemented in the last quarter of 2018. “North and south, as they agreed, should take practical measures proactively to remove military hostility on the whole of the Korean peninsula, including the ground, airspace and sea, as a follow-up to its ending in the areas of confrontation,” Kim noted. Following up on this, Kim called on South Korea to cease military exercises with the United States, which he cited as “the source of aggravating the situation on the Korean peninsula.” He did not specifically call for the upcoming Foal Eagle and Key Resolve U.S.-South Korea exercises to be called off. Separately, Kim urged South Korea to seize the historic opportunity available to the two Koreas and move forward on economic cooperation with the North even in the face of international sanctions. “When north and south join hands firmly and rely on the united strength of the fellow countrymen, no external sanctions and pressure, challenges and trials will be able to hinder us in our efforts to open a broad avenue to national prosperity,” Kim noted. For many South Korean progressives eager to pursue further inter-Korean rapprochement, that line will have appeal. South Korea’s efforts to forge inter-Korean cooperation are limited by what is legally permissible under the extensive United Nations Security Council sanctions resolution in place against North Korea. 4. The ‘new strategic line’ is here to stay. This new strategic line is presumably the successor to the named byungjin line, which Kim declared as having been successfully carried out last April. That line focused on attaining a nuclear deterrent in parallel with economic development. Now, with the deterrent attained in 2017, Kim has shifted focus to the second leg of byungjin exclusively. The focus this year, as ever, was on economic self-sufficiency, with Kim calling for improvements in everything from industrial output to management techniques. A particular focus that jumped out this year was on energy self-sufficiency. With international sanctions and monitoring of ship-to-ship transfers making it more difficult than ever for North Korea to freely export coal, Kim called for the domestic utilization of the country’s coal to provide energy. He additionally called for the construction of hydroelectric power stations and the implementation of tidal, wind, and atomic power solutions to provide energy to fuel North Korea’s economic development without external assistance. On the latter, Kim may be hinting at the possible start-up of a new facility at the Yongbyon complex thought to be an experimental light-water reactor this year.